Tired of trawling the Web for the latest news on, say, the Apple iPad? Or Tiger Woods' return to golf? How about a favorite band? Typically, you get this kind of information by running a search--but that's a hassle if you end up running the same search every day or even several times per day. Why not flip things around and let the results come to you, automatically, at designated times? That's the idea behind Google Alerts, a free (natch) Google service that delivers topical search results to your inbox or RSS reader. The one and only requirement: a Gmail account. 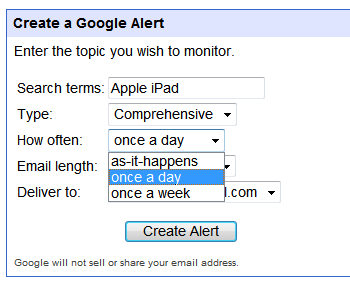 To set up an alert, start by entering one or more search terms (just like you would for a regular Google search). Then, click the Type field to specify what source Google should use: News, Blogs, the Web, Video, Google Groups, or, if you want all of the above, Comprehensive. Next, decide how often you want to receive alerts: "as it happens," once a day, or once a week. The first option is nice if you're following, say, a breaking news story, but keep in mind it can lead to a huge influx of e-mail: You'll get an alert every single time Google finds a match to your search term(s). Google also gives you a choice of e-mail length: up to 20 results or up to 50 results. I can't see much point in choosing the former, unless perhaps you're reading your mail on a mobile device and want to keep messages brief. Finally, decide if you want the alerts to arrive via e-mail or feed (i.e. RSS feed, which can go to your Google Reader page or the feed-reader of your choice). I've used Google Alerts for a couple years now, and think it's one of the unsung heroes of the Google tool collection. It's a great time-saver, and an incredibly handy way to keep tabs on topics that interest you.